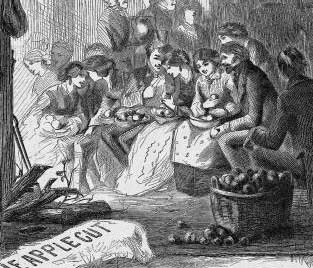 Apples are sliced and put on drying racks which are then placed in the brick bake oven after all the baking was done. Rye baskets to store the schnitz were made in various sizes. This large floor sized one was made by Tom Martin, who was the head of the Landis Valley museum kitchen for 30 years in Lancaster, PA... heart of the Pa. Dutch area. "Schnitz. "—A very large quantity of apples are evaporated in the homes of farmers in all parts of Pennsylvania. While this product is made mostly for the purpose of home consumption, a large quantity of it finds its way into the city markets, as it is preferred by many to machine made fruit. This home-made evaporated fruit is most generally known in Pennsylvania under the name of "schnitz," from a Pennsylvania German word meaning slicings or cuttings. The product is very rarely sulphured and so is more discolored than the evaporated article. The apples after being pared and sliced are simply dried in pans or trays upon the back of the stove or in the oven when the fire is low. A number of small portable evaporators are at present being manufactured for making home evaporated fruit; they are adapted for use upon an ordinary cook stove and after filling the trays require but little care or attention." Schnitz House. Built in 1749 by the Moravians in Bethlehem, Pa.
"The wood cut at the head of this chapter, is a correct representation of the "Schnitz House," so called from the German word, schnitz, to cut, or slice. It is a long, one-story log house, plastered over on the outside, in imitation of stone, and is still standing; back from the street, on the first lot east of the "Sister's House," on Church Street. It was erected in the early days of the settlement, and used by the Sisters as a place to cut and dry apples, which were then extensively used in the winter for pies, by the inhabitants. There was formerly a large orchard of apple trees surrounding the house, and in the rear of the “Sister's House." With the Germans of Pennsylvania, pies of all kinds seem to be considered one of the absolute necessaries of human life; they eat them at every meal; as well as cakes, preserves and pickels of all sorts. They also drink strong coffee three times a day, and are not a nervous people." "Schnitz and knep" is said to be made of dried apples, fat pork, and dough dumplings, cooked together." AUNT SARAH'S "SCHNITZ AND KNOPF"
This is an old-fashioned "Pennsylvania German" favorite. The end of a ham bone, containing a very little meat, was placed in a large kettle with a small quantity of water, with "Schnitz," or sliced, sweet, dried apples, which had been dried without removing the parings. When the apples were cooked tender in the ham broth; dumplings, composed of the following, were lightly dropped on top of the apples and broth and cooked, closely covered, from 15 to 20 minutes. Do not uncover kettle the first ten minutes. When dumplings have cooked place them with the "Schnitz" on a large platter, and serve at once. A VERY OLD RECIPE FOR DUMPLINGS, OR "KNOPF"
One and one-half quarts of flour was sifted with 2 1/2 table-spoonfuls of Royal baking powder, 1 teaspoonful of butter was cut through the flour in small bits, 1 egg was beaten and enough milk or water added to the egg to mix the flour into quite a soft dough. Sometimes instead of molding the dough into balls large spoonfuls were placed over the apples. Aunt Sarah had used this recipe for many years. This is a very old recipe, and from it was made a larger quantity than ordinary housekeepers usually require. Half the quantity, about 1 1/2 pints of flour to 1 1/4 tablespoonfuls of baking powder, mixed according to the directions given in the first part of recipe, would be about the correct proportions for a family of ordinary size.